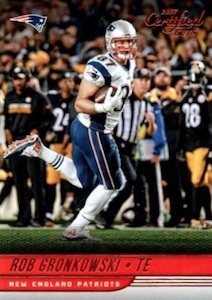 Seeming to take its inspiration from multiple brands, 2017 Donruss Certified Cuts Football provides old-school fun with a far-reaching look at the NFL, even touching on the history of the United States. 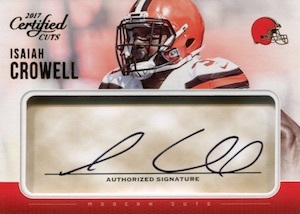 Although collectors can count on four hits per box, at least two of those should be autographs. Displaying nearly a full-bleed design, the primary set is split into several subsets with the first 100 cards as part of the standard base. 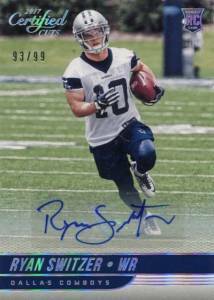 There are also 50 Legends and 50 Rookies, the later of which have Rookie Script autograph parallels. 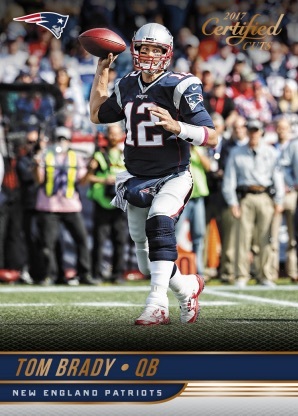 In addition, limited Silver and Gold parallels provide more options across the main set. 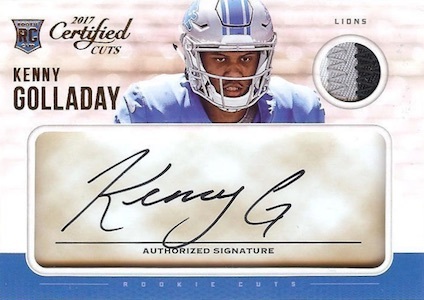 Extending from the base set, the 2017 Donruss Certified Cuts Football checklist also offers 40 Rookie Cuts autographs, which mimic the look of a cut-check signature and add a small relic piece. 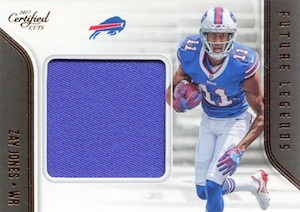 Among the six rookie parallels are ink variations. 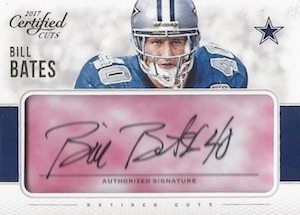 This distinct treatment is not reserved for only the rookies, as Modern Cuts visits current stars and there are also Retired Cuts options with the replicated "cut signature" look. 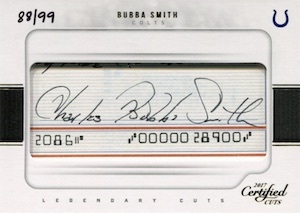 Limited to 99 copies or less, Collegiate Cuts and Legendary Cuts are traditional cut signatures. Naturally, the Cinematic Cuts and Historical Cuts sets step away from the field to identify key names from the past. Going a step further, one-of-one Cuts Memorabilia Booklet cards add a jumbo relic and Dual Cuts Booklet cards double up the subjects. 2017 Donruss Certified Cuts Football hobby boxes have SRP of $144. Base Legends - #/399; Base Rookies - #/399. PARALLEL CARDS: Silver #/99, Gold #/10. 48 cards. Serial numbered #/199. Shop on eBay. PARALLEL CARDS: Silver #/99, Gold #/25. PARALLEL CARDS: Red #/99 or less, Blue #/25 or less, Green #/5 or less. INK COLOR PARALLELS: Red Ink SP (25 copies), Blue Ink SP (10 copies), Green Ink SP (1 copy). PARALLEL CARDS: Red #/15 or less, Blue #/10 or less, Green 1/1. PARALLEL CARDS: Silver #/10 (Peppers/Miller - #/3*). PARALLEL CARDS: Silver #/49, Gold #/5, Black 1/1. PARALLEL CARDS: Silver #/5 (Reggie White - #/4*). PARALLEL CARDS: Gold #/10, Silver #/99. PARALLEL CARDS: Silver #/10 (Jason Witten - #/9; No Peppers, Rodgers*), Gold 1/1 (No Witten*). 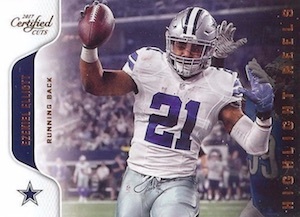 I like the concept, especially some of the big chase cards here, but why do we need yet another set with base sticker RC Autos. Got really excited reading about this product. But the base STICKER auto’s are a deal breaker for me. I like the product and the concept. Please don’t take this the wrong way, but you guys do understand stickers are unfortunately, a necessary evil in the hobby. There is a lot the average consumer doesn’t know and I would be upset about stickers too if I didn’t know all the semantics. Manufacturers are required to produce a certain number of skus, athletes won’t always sign, they refuse to sign cards, etc. There are some incredible chase cards and one in particular I am determined to own! 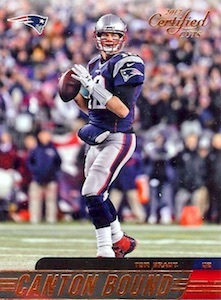 Check us out, Sports Card Investors on YouTube and Facebook! Disappointing. Sticker Autos. Fake checks. Boring design. Great idea…….very very poorly executed. Multiple autos & jersey duplicates in same case. I rate products based on case content and money making opportunities and this product gets an F- on both. NOT even 1 card in the case that i could get over $50 on and that’s a killer on a $1500 case. Cases need to have at least enough random content to get close to breaking even on it. I was not expecting to get one of the super rare cards………but there was no case hit at all in this case. Worst content I have seen in an expensive case ever!………AVOID this product unless you like to torch up $100 bills because it would be cheaper just to light 5 of them on fire than to invest in a case of this! @jacob enlighten me on the “fake checks” they used? I watched a case break of this and didn’t care for it much, I think it should have had a pack layout like 16′ prime signatures. the base is identical to 17′ prestige. For the money (purchased a case), my answer is if you haven’t purchased it, don’t. Save your money for something else. If you’re a collector you may be disappointed if you get a case like mine. If you’re a seller of cards, then NOPE this is not for you unless you purchase numerous cases, and even then you will probably be losing money. Hands down for me on this one. I was pumped when I began to open packs from my hobby box. After ripping through the 12 packs it was a big let down. I didn’t get the 4 auto or memorabilia card. I only received 3 and a 400 points card. What a let down. Base cards are average at best. Plus, card stock why so flimsy? 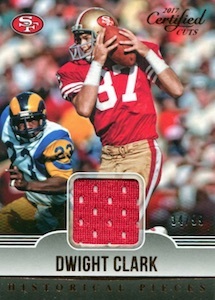 Best numbered cards were /399, another blow. Darn, can’t go lower than 1 Star. Was waiting for this product to come out and arrive at my door. Finally received it. Opened up the 1st box, then the next, then the next, until the case was totally opened. What a piece of CRAP!!! The base cards are cheap and flimsy, and where are the autos that we all recognize and love. I will never ever purchase this waste of a product again. I’m done with this after paying a fortune for the case, I get junk. WARNING WARNING —DO NOT buy this crap, let someone else buy it and waste their money and then you purchase the card you need. I am so disappointed in this junk. Panini failed again. How hard is it to put at least 1 good card in the entire case. Hey maybe I can ask them to give me my money back so I can pay my mortgage – at least it’ll go to a good cause. 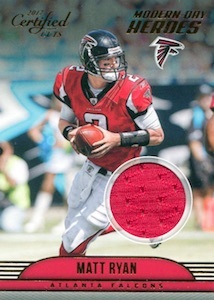 I have no idea why Panini issues so may products.? If they are truly making money off each issue then I have my answer, but I doubt that is the case. The net result is a watering down of value of the whole market. Most of these issues could be subsets of others like this issue of Certified cuts, which I would roll into the Classics set. Immaculate, Illusion, Impeccable, infinity, Inception, what next, Imbecilic? Card companies should stop watering down the industry! Ok, so the checklist is out, BUT why do the ink variation colors not show exactly how many were produced? A green ink is said to be the 1/1, but it doesn’t show that on the checklist, so what is the blue on blue, and red on red? They are not numbered and the checklist left them intentionally blank?? are they all 1/1 ? Information about the ink color print runs for the rookies are listed on the checklist and have been for some time. As indicated by Panini and noted above, Green Ink has 25 copies, Blue Ink has 10 copies and Green Ink has one copy. I am talking about the ink variations of the signature color itself. The spreadsheet is showing that the red #25, blue #10 and green #1, yes and I understand that, but apparently that is for the background color when the signature is in black ink. If the signature is in an actual color itself that matches the background, there seems to be no clue on how many of those there are. The spreadsheet itself even left those blank. If we could get an answer on this it would be amazing. If you look at the Rookie Cuts Autograph Relic set, you can see it notes parallels in Red (#/99 or less), Blue (#/25 or less) and Green (#/5 or less). These are for when the ink color remains black, but the color of the signing area changes. The actual ink changes, noted in the Ink Color Parallels section, offers the info directly from Panini. For these, the breakdown includes Red Ink SP (25 copies), Blue Ink SP (10 copies) and Green Ink SP (1 copy). That is what I was referring to in my orignal post.